When problems do arise we may need special tests to help us make a diagnosis or monitor a condition. For these occurrences we have both in-housing testing as well as outside laboratory consultations. Ultrasound: on call as needed. Our hospital is fully equipped for most elective, non-elective, and emergency procedures. We have a State-of-the-Art dental machine equipped with special instruments and ultrasonic scalers to remove plaque and tartar. It’s estimated that without proper dental care, 80% of dogs and 70% of cats will show signs of oral disease by age three. The Companion Therapy laser treats a variety of ailments in pets from skin lesions to arthritis, and Irritable Bowel Disease to post operative pain and inflammation. Treatments are fast and pain free, many pets even find them relaxing enough to doze off! Visit www.litecure.com/companion for more information on the variety of ways laser therapy can benefit your pet and to read real patient success stories! Offers on call diagnostic Ultrasound services to our clinic and surrounding area. Joanne has been in private companion animal practice in Pennsylvania and North Carolina since graduation in 1988 from North Carolina State University College of Veterinary Medicine. 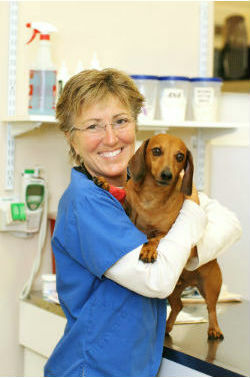 She also holds a Masters Degree from Clemson University of Tennessee College of Veterinary Medicine. In the past few years she has been she developing her interest in Ultrasound diagnostics and completed over 400 hours in Ultrasound training in 2015. Joanne lives in Wilmington with her husband and three dogs. Dogs can donate blood to other dogs and cats can donate blood to other cats.